On a quiet morning three hundred and ten years ago, in September 1706, five French warships sailed into Charleston harbor carrying a thousand French, Spanish, and Native American warriors. Their mission, sanctioned by King Louis the 14th of France, was to destroy Charleston and to force the English to abandon the young colony of South Carolina. Our colonial militia bravely resisted, however, and over a period of two weeks these international forces clashed in a number of skirmishes, from the Charleston peninsula, to James Island, Hobcaw Point, Shem Creek, all the way to Sewee Bay. In the end, the South Carolina militia was victorious, and the surviving French and Spanish forces retreated in humiliation. For several generations after the invasion of 1706, this dramatic episode was remembered in our community as a major turning point in the preservation of South Carolina. As part of the larger international struggle for empire in North America, the failed French and Spanish attempt to destroy Charleston helped to ensure that English (later British) settlers would continue to dominate the mainland. Questions? Drop me a line at butlern[at]ccpl.org or call 843–805–6968 for more information. Where is the South Wall? How does one find evidence of an earthen wall and moat that were dismantled nearly 300 years ago? In urban Charleston, a traditional archaeological excavation is not always possible because the built environment is now quite dense, and because there are a myriad of private property concerns. An alternative is to use ground penetrating radar (GPR), which allows one to “see” features below the surface without disturbing the ground at all. But can GPR technology identify a centuries-old earthen feature that now might be just a stain in the ground? That’s the question the Walled City Task force hopes to answer this summer with a test in the school parking lot of downtown Charleston’s First Baptist Church. In the late afternoon of Tuesday, June 21st 2016, task force members gathered at the First Baptist parking lot to meet with Dr. Jon Marcoux, an archaeologist and professor at Salve Regina University in Newport, Rhode Island. 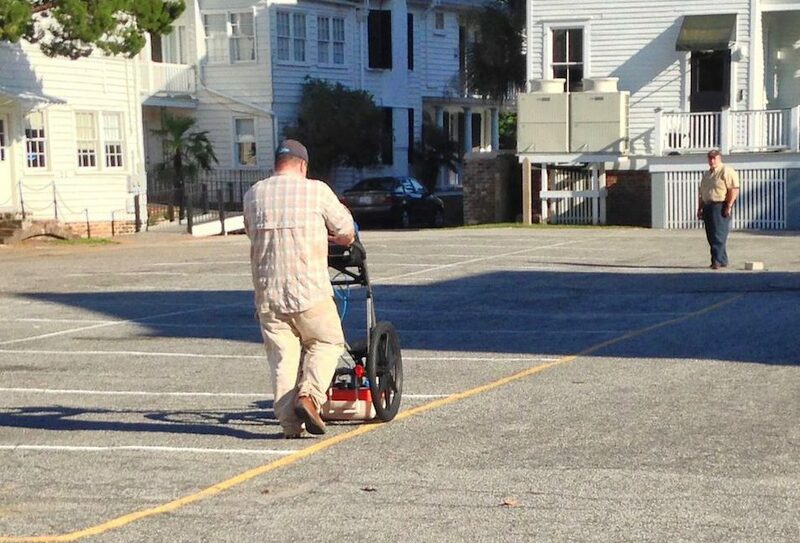 While in town conducting an archaeological field school at Charles Towne Landing, Jon offered to work with the Task Force to perform some quick GPR work downtown, and we steered him toward the aforementioned parking lot. Why? Because it’s a relatively open area that has been relatively undeveloped, and might afford us the best opportunity to locate and measure the earthen wall and moat that once protected the southern side of early colonial Charleston. 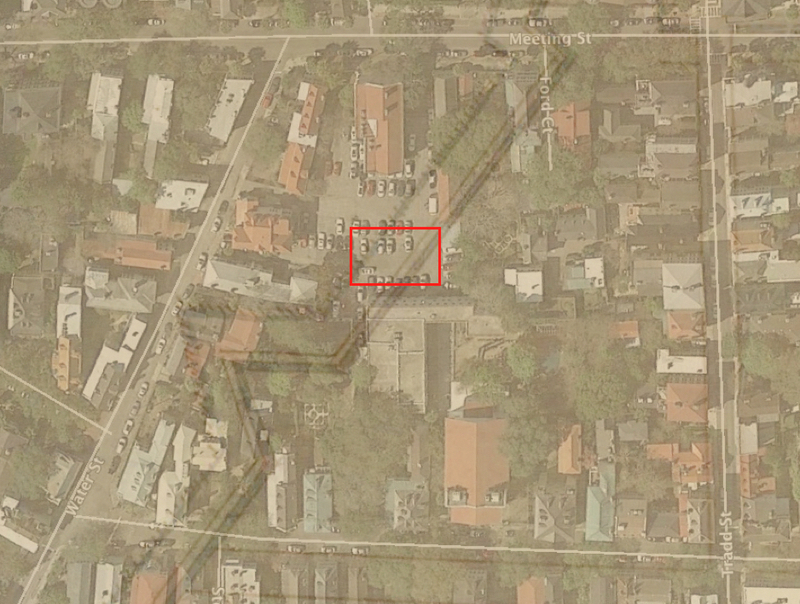 The present school parking lot of First Baptist Church is located approximately midway between Church and Meeting and Meeting Streets in downtown Charleston, slightly north of Water Street (which was formerly Vanderhorst’s Creek) and south of Tradd Street. By laying a 1721 map of the town’s fortifications over a modern Google Earth view of this site, and attempting to rectify the differing scales of these maps, we determined that a significant portion of the earthen wall and moat might be located under the northeast area of the present parking lot. In the image below, I’ve used a red square to outline the approximate size of the area surveyed on 21 June 2016. With permission from the kind folks at First Baptist Church, we created a temporary grid of approximately twenty by twenty-five meters of uninterrupted space in the asphalt-paved parking lot. We could have done a slightly larger area, but our efforts were restricted by time, a large storm water drain, and an errant parked vehicle. Jon used a 400 MHz GPR antenna, which is capable of “seeing” a few meters deep, but in our sandy soil the resolution is a bit compromised. 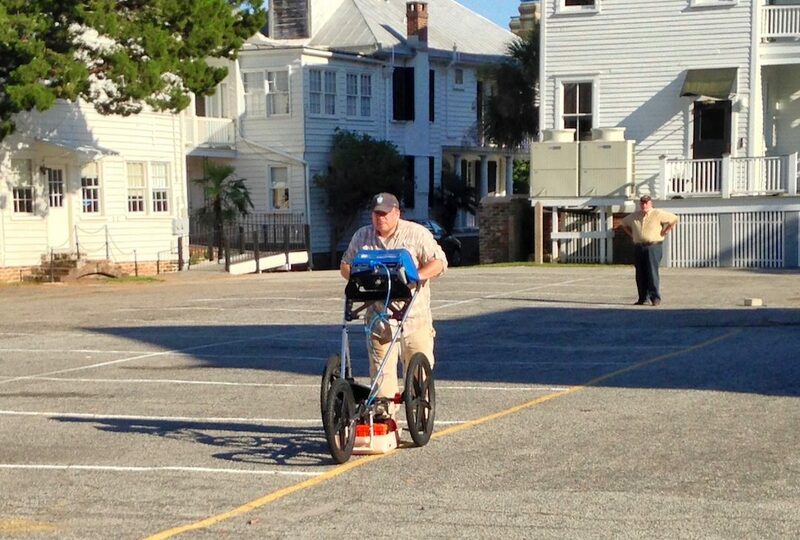 The GPR equipment includes a real-time display that shows the operator a rough outline of the earth below the antenna. During our work on Tuesday, Jon observed a repeating pattern of “slumping”—a feature appearing to trail off from shallow to deep—that might indicate an edge of the moat. If this turns out to be the case, it will be the first time that anyone has located evidence of the town’s early earthen walls and moat that were dismantled in the early 1730s. Dr. Marcoux is again busy with his field school, and will soon return to Rhode Island. We’ll have to wait a few weeks for him to compile and analyse the data, but we’ll keep our fingers crossed. If you’d like to learn more about this investigative process and the results, you’ll have a chance in late August, when I’ll host a public program at the Charleston County Public Library. Tuesday, 30 August 2016 at 6 p.m., at Charleston County Public Library Auditorium, 68 Calhoun Street, 29401. The accumulated fortifications that surrounded urban Charleston in the spring of 1780 proved insufficient to withstand a powerful British siege, and the town ultimately surrendered to the invading army on the twelfth day of May. The details of that long, bloody siege have been discussed by many historians (most ably in Carl Borick’s 2003 book, A Gallant Defense), but the relative calm that settled over the Charleston after the surrender has received far less attention. During that period of two years, seven months, and two days, the denizens of urban Charleston lived under a repressive yet oddly conscientious shadow of British martial law. Those who publicly pledged loyalty to the Crown enjoyed greater personal and commercial freedoms, of course, while those who scorned the occupying power enjoyed few liberties and lived under the eyes of constant surveillance. Carl Borick’s 2012 book, Relieve Us of this Burden, provides a much-needed examination of the British treatment of American prisoners of war following the capture of Charleston. But what about the lives of the town’s civilian population? The British military authorities created a “Board of Police” to administer the town, a system that actually marked an improvement over the old Provincial government’s relatively negligent rule of unincorporated Charles-Town. Commissioners were appointed to oversee the markets, interments, streets and address numbers, and civil suits. For many loyalist citizens, the town was running smoother than ever and business opportunities were ample. For most rebels, however, the two-and-a-half year occupation reinforced their anger and fueled their desire to push their enemy out of South Carolina. The British intended used the capture of Charleston as an example to pacify the rest of the state into submission, but their gross mismanagement of the situation ultimately gave strength to the American resistance. Wednesday, 13 April 2015 at 6 p.m., at Charleston County Public Library Auditorium, 68 Calhoun Street, 29401. The earliest fortification projects in urban Charleston were motivated by the fear of invasion from our Spanish neighbors to the south. 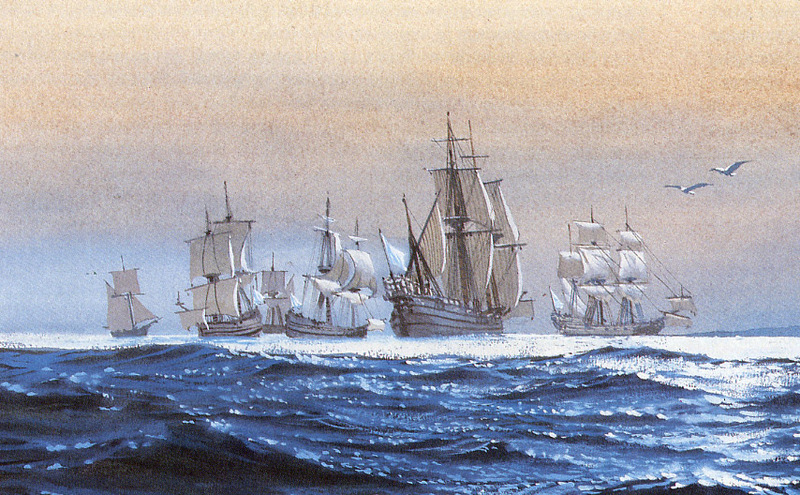 In the autumn of 1686, a small Spanish fleet sailed northward from St. Augustine, Florida, with the hopes of driving the English out of South Carolina. 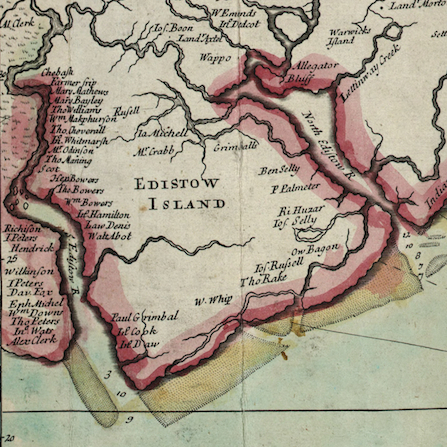 Stopping first at Edisto Island, then Carolina’s southernmost settlement, the Spanish forces invaded and destroyed most of the island’s English possessions. Were it not for the sudden arrival of a hurricane, the Spanish would have continued northward and challenged the nascent fortifications of Charleston. Want to learn more about this fascinating story? Please join me for a look at the motivations behind the 1686 attack and its impact on the early history of both Edisto and South Carolina in general. Thursday, 12 November 2015 at 5 p.m., at Trinity Episcopal Church Hall, 1589 Highway 174, Edisto Island, SC 29438. Monday, 16 November 2015 at 6 p.m., at Charleston County Public Library Auditorium, 68 Calhoun Street, 29401. In past programs we’ve discussed the histories of the most prominent features of Charleston’s early fortifications, such as Granville Bastion, Craven Bastion, and the Half-Moon Battery. Numerous details regarding these works can be found among the surviving records of South Carolina colonial General Assembly and other archival sources, so we know a good bit about their design, location, and demolition. 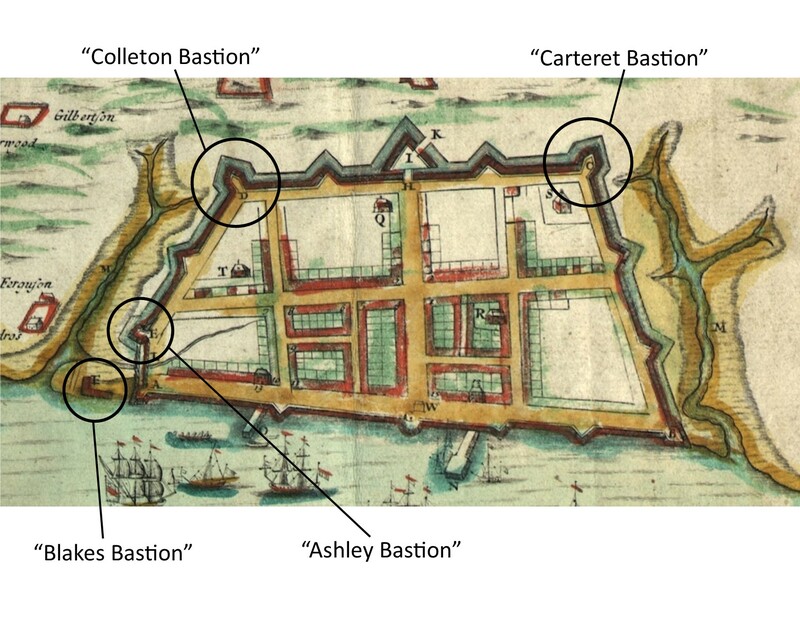 For the next program, however, I’m going to attempt to tell the story of the lesser-known bastions of the walled city; specifically, the bastions named Ashley, Carteret, and Colleton, as well as the enigmatic structure known as Blake’s Bastion or Blake’s Battery. These structures existed contemporaneously with the aforementioned bastions, during the early years of the eighteenth century, but relatively little is known about them. For a variety of reasons, these lesser bastions merited less attention from the denizens of early Charleston, and thus it’s now difficult for us to tell their stories. The following is a brief summary of what I’ve been able to learn by reading all of the surviving journals of our colonial government. When credible intelligence of a Spanish plan to invade Charleston reached the South Carolina General Assembly in December 1703, the town’s fortifications consisted of an unfinished brick “fortress” at the south end of [East] Bay Street, a recently finished brick “Half-Moon Battery” at the east end of Broad Street, and a brick wall along the waterfront connecting the fortress and the battery. The assembly voted to begin immediately the construction of fortifications around the most defensible part of the town (roughly 62 acres of high land between Vanderhorst Creek to the south and Daniel’s Creek to the north), by means of a chain of bastions and redans (also called “salient angles”) connected by an earthen wall (or “entrenchment”) and surrounded by a moat. 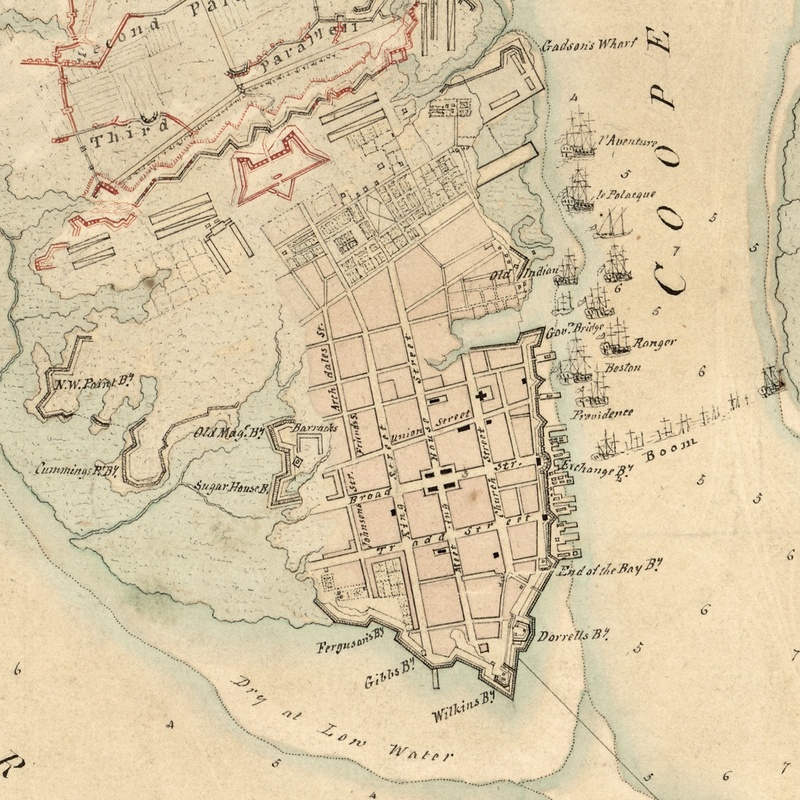 These works, which were “largely perfected” by October 1704, transformed urban Charleston into a “walled city” and endured for nearly three decades. The corners of the trapezoid-shaped walled city were protected by diamond-shaped works called bastions, each of which was named for one of the Lords Proprietors who owned the Carolina colony. The brick “fortress” at the southeast corner was named Granville Bastion, while the new brick work at the northeast corner was named Craven Bastion. These large structures were maintained and used into the 1780s, and consequently we know a good bit about their history. The other bastions didn’t last nearly as long, and we know far less about them. 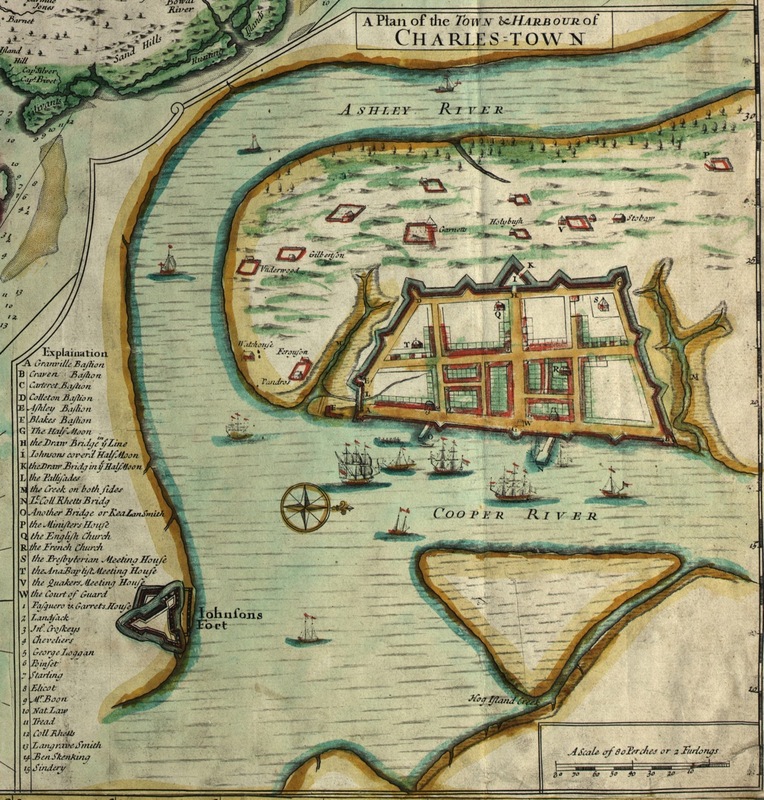 A close-up view of the map of Charles Town published in 1711 by Edward Crisp, highlighting the “lesser-known” bastions. Colleton Bastion, the southwest corner of the walled city, stood approximately on the site now occupied by the First Scots (Presbyterian) Church at the southwest corner of Tradd and Meeting Streets. It was constructed and armed in 1704, but its cannon were removed to the “curtain line” along East Bay Street sometime between November 1721 and November 1723. No descriptions of its appearance or dimensions are known to exist. Colleton Bastion was gone by the spring of 1733, when the newly formed Presbyterian congregation purchased the site and began building their first church. Carteret Bastion formed the northwest corner of the town wall, but its precise location is a bit of a mystery. It probably stood somewhere very near the northwest corner of Meeting Street and Horlbeck Alley/Cumberland Street, but we’re not yet sure. The matter is complicated by the fact that the northward trajectory of Meeting Street was altered slightly in the years immediately after the bastion was removed. Archaeological testing in the early 1980s and early 2000s eliminated the southwest and southeast corners as possible sites of this bastion, and anecdotal evidence suggests that at least part of it may have covered the northeast corner of that intersection. Like Colleton Bastion, we know that Carteret Bastion was armed and ready by late 1704, but by December 1723 its cannon had been removed to augment the arsenal at Craven Bastion. Similarly, we know nothing about the appearance or dimensions of Carteret Bastion. Ashley Bastion stood due west of Granville Bastion, and may have originally been intended to form the southwest corner of a square “fortress” planned in 1696–97. Its shape is unclear in the “Crisp Map” of 1711, but in Col. John Herbert’s “Ichnography or Plann of the Fortifications of Charlestown,” drawn on 21 October 1721 (now among the records of the National Archive of the United Kingdom), Ashley Bastion is drawn as a hexagonal structure of indistinct size. Although its placement between Granville Bastion and Colleton Bastion may seem irrational, we know Ashley Bastion stood on the west side of a creek or inlet and swamp, and thus its location enhanced the security of the town’s southern side. Beyond these facts, we know little about the size, construction, or precise location of Ashley Bastion. Like the other lesser bastions, it had been stripped of its armaments (and probably demolished) by December 1723. Blake’s Bastion, also called Blake’s Battery, was not technically a bastion. Rather, it was a “V”-shaped detached work, like a fleche, placed a short distance due south of Granville Bastion. Due to the sparse number of surviving documentary references to its existence, however, it is unclear whether Blake’s Battery was built before or after the construction of its neighboring bastion. Tactically, the purpose of this work was no doubt to defend the mouth of the small creek or inlet that ran between Granville Bastion and Ashley Bastion. Although we know nothing about its size or precise location, we know that Blake’s Battery was built at least partly of brick. In December 1712, when work commenced on the construction of “the new brick church” that became St. Philip’s Church, the South Carolina General Assembly (who funded the church) ordered Col. William Rhett to oversee the removal of “the bricks that compose the battery called Blakes Battery” to the site of the new church. After that reference, Blake’s Battery disappears from the historical record. Wednesday, August 12th 2015 at 6 p.m. The funeral for CCPL librarian Cynthia Graham Hurd has been set for the morning of Saturday, June 27th, at which time all library branches will close to allow staff to attend the services. As a consequence, the upcoming program about Sergeant William Jasper, scheduled for noon on Saturday, has been canceled. The encore version of the William Jasper program will take place as scheduled, on Wednesday, July 8th at 6 p.m., at the library’s main branch at 68 Calhoun Street. For more information about the services in memory of CCPL librarian Cynthia Graham Hurd, please refer to the official press release posted on the CCPL website.